WestJet and American announced yesterday the launch of their code-sharing partnership (see our previous post on the initial announcement) with American placing their codes on WestJet flights between Montreal and Winnipeg and between Toronto and Edmonton. This will ultimately be expanded to cover nearly 20 cities in Canada. WestJet on the other hand will initially place their code on American flights between Toronto and Los Angeles and Dallas Ft. Worth. With more routes being implemented in phases. As we had previously mentioned their will also be reciprocating frequent flyer program earning on these code-share flights (ie WestJet Frequent Guest dollars for the AA flights, AAdvantage Miles for the WestJet flights). There is talk of further expanding the relationship of the FFP's which I would assume to mean the ability to redeem dollars/miles on these flights as well. If this comes into play then some of our yearly credit card rankings may change as holders of the TD AAdvantage Visa would finally have access to domestic flights and holders of the WestJet RBC MasterCards would have access to more of the U.S. market. We've been talking about another hotel chain launching a credit card for nearly 2 years now and we can finally let you know that it was InterContinental Hotels Group Priority Club that has been in the works. Today, Capital One will announce their partnership with IHG to issue a co-branded Priority Club Reward credit card in Canada. This will the 5th hotel rewards program to have a dedicated Canadian credit card. Details on the card are not out yet and are expected to be released in the second half of 2011 (not sure if it will make it in time for our 2011 top credit card rankings, we'll just have to wait and see!). If this card comes with decent benefits, sign up bonus and earning ratio then it should do quite well in the Canadian market as IHG offers many hotels in Canada alone and over 4,400 worldwide. The redemption options for Priority Club are quite decent as well and comparable to other hotel programs that have credit cards in Canada. Be sure to keep checking RewardsCanada.ca in the future for all the details on the card once they are released. iHere in Canada (and in the U.S.), Diners Club has been relatively quiet since the North American franchise of the brand was offered up for sale by Citibank and acquired by BMO. Overall however, the brand Worldwide is seeing some positive changes to the benefits offered to Diners Club cardholders and with the card set to take applications once again in North America sometime this year, the card may regain some traction that it once held with frequent travellers in the U.S. (the card won many Freddie awards in the past) and in Canada (the card was the number 1 hybrid card in Rewards Canada's 2009 rankings). For those of use who were lucky enough to have or get the card before they stopped accepting new applications in 2009, we all understand how good this card has been and are looking forward to when BMO relaunches it later this year. Airport Lounge Access: One of the great benefits of this card outside of free Priority Pass membership is direct access to business class lounges around the World. Back in 2009, a Diners Club cardholder could access just over 115 lounges, recently this has been extended to over 350 lounges worldwide! A great enhancement which I actually made use of recently when I used my Diners card to enter the KLM Crown Lounge in Toronto's Pearson airport. It made my 5 hour stay at the start of spring break quieter and more relaxing then if I had been in the extremely busy general airport areas. To see all of the lounges that a Diners Club card offers access to please see here. Diners Club Privileges: Now, I can honestly say that I have never seen this before, perhaps it has been around longer then when stumbled upon it but on the Diners Club International site they have Cardmembers Benefit section which also has a sub section called Diners Club Privileges. The Privileges section lists discounts, benefits etc. that Diners Club cardholders can make use of. When I looked at it today it offered discounts at Macy's stores in the U.S., hotel discounts in Europe and much more. For me, this is a page I will visit way more often to make sure I catch deals for the places I am travelling to. To see the Privileges, click here. For those Canadians reading this that do not have this card and are interested in it, please keep checking back as we will most definitely provide the news to Canadians when this card is opened up once again for applications. Early last week (sorry been traveling and didn't get a chance to put this up sooner) United's official rep to Milepoint.com posted new tools for members of United's Mileage Plus and Continental's OnePass programs to transfer miles between accounts and combine elite earnings between them as well. The reason for these tools is that the two airlines frequent flyer programs are still operating as separate entities until they are combined sometime in 2012. Transfer redeemable miles between your OnePass and Mileage Plus accounts at united.com/transfermymiles or continental.com/transfermymiles (both take you to the same place). Match Elite status and combine Elite earnings for your OnePass and Mileage Plus accounts. For those of you who have Elite Qualification miles and segments/points in both OnePass and Mileage Plus, you can now combine these earnings to earn Elite status, Regional Upgrades and Systemwide Upgrades. Go to united.com/combinemyactivity or continental.com/combinemyactivity for all the details. Montreal, QC, March 14, 2011 Aeroplan today announced that it has donated 1 million Aeroplan Miles to the Canadian Red Cross to support the emergency relief efforts in the aftermath of the recent earthquake and tsunami in Japan. Aeroplan will also match its employees' individual cash contributions to the Canadian Red Cross while Groupe Aeroplan will match cash contributions to the Red Cross or the Red Crescent from its employees worldwide. In addition, Aeroplan Members who wish to support the Canadian Red Cross can donate their Aeroplan Miles online at www.aeroplan.com. "Our hearts go out to the people of Japan at this time," said Vince Timpano, President and Chief Executive Officer, Aeroplan. "We hope that our donation will assist relief efforts in the aftermath of this terrible disaster and we invite our members to join us in supporting the Canadian Red Cross." The partnership between Avianca and TACA has grown even stronger as each airline has stopped their old FFPs (Plus and Distancia respectively) with the launch of their new unified program called LifeMiles. All miles held in the old accounts are being honored and should be in member's new LifeMiles accounts. Elite status in either program is also being honored in the new program. Apparently members old account numbers will be the same in LifeMiles. Overall the new programs is stated as being better and they provide a chart on the LifeMiles website comparing it to the old AviancaPlus and Distancia programs. Apparently achieving elite status will be easier, there will be a better upgrade policy and there will be many more mileage earning opportunities. To see the comparison chart click here. Overall the program does look like a bit of an improvement over the old programs and this will be an interesting one to watch over the next year or so to see if they live up to their promises. One thing I can tell you right off the bat is their new website is much better then the old AviancaPlus or TACA Distanica sites. You can find bonus offers for the new program on the new LifeMiles page on Rewards Canada. Our page for the old TACA Distancia program will no longer be updated. Already known for their flights to sunnier destinations down south, charter carrier Sunwing has announced that they will offer flights between Canada and Europe for the Summer 2011 season. Using a leased Boeing 767 the airline will offer charter flights between Montreal and Paris; Toronto and Amsterdam, Dublin, Lisbon, London (LGW), Paris, Porto and Rome. The flights will run from June 16 through to September 12. Many of you have probably already seen that the voting for the second annual FT Awards is now open. If not, well here is your notice and your chance to go vote for your favorite airline and hotel programs in six categories to recognize the best promotion for redemption, best promotion for earning, best redemption ability, best customer service, best elite level and best loyalty credit card. A seventh award will recognize the overall airline and hotel 'Program of the Year' in each region. The Awards will be handed out at the Frequent Traveler Awards ceremony at Citi Field in Flushing, New York on April 28, 2011. Holders of the Capital One Aspire Travel™ World MasterCard® and Capital One® Aspire Travel™ Platinum MasterCard® now have their own dedicated rewards site for the Reward Miles they earn on the cards. The site provides cardholders information on how and where they can redeem their miles (I know this was a complaint for those looking to get the card as originally the Capital One site did not provide much information on this). It also allows cardholders to redeem their miles against the travel charges put onto their cards from any travel vendor. This is a feature I really like and not many other travel anywhere cards are offering this feature yet (TD, Amex, Diners you have to call in to redeem points against your travel charges). Some do have online booking engines like BMO's Elite World MasterCard but the difference with them is that you have to book with them and not with whomever you like. For non-cardholders they provide a demo on the site as to how it works and it looks quite plain and simple. I applaud Capital One for taking this step in addressing cardholder and non-cardholders concerns with wanting more information on the redemption process. To visit the new rewards site for Capital One please click here. 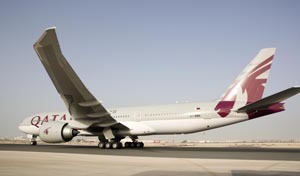 On February 27th, Qatar Airways has formally announced the launch of their much anticipated Montreal - Doha route. The route will begin June 29 and will initially run three times weekly. Montreal is QR's fourth North American destination and first in Canada. We are pleased to be affiliated with Qatar Airways (you can book flights via this link) and with the launch of any new airline to Canada we have added a bonus offer page for the Qatar Airways' Privilege Club program (http://www.rewardscanada.ca/privilegeclub.html) Although it has not been confirmed yet we should be able to expect a bonus Privilege Club mileage offer for this route shortly as QR almost always has route launch bonus offers. Following an earlier interlining announcement in October 2010, WestJet and American Airlines have announced a new code share agreement between the two airlines. The agreement will allow each airline to place their codes on the other airlines flights. At this point this means American customers will be able to connect to up to 20 cities in Canada that AA or American Eagle does not serve while WestJet customers will be able to fly on WestJet coded American Airlines flights from Canada to Boston and Chicago. Future arrangements should see the WestJet place their codes on American flights to more cities. For our readers, the biggest perk here is the reciprocal frequent flyer benefits in the agreement. This means members of either airlines frequent flyer programs will be able to earn AAdvantage miles or WestJet dollars on the code share flights. What is unknown at this time is whether you have to fly a connecting flight on your actual airline to earn miles/dollars or if you will be able to earn those miles for the code share flight only. In most other agreements as long as the flight has your main airline's code then you get the miles/dollars but on some occasions some programs have made it more restrictive that you have to connect to/from a flight flown with your airlines own metal. Hopefully that will not be the case here as they may attract a few more business customers to the WestJet frequent guest program primarily out east with the numerous flights that AA has from Eastern Canada to Boston and Chicago.